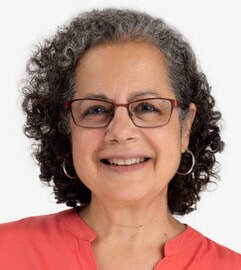 About Me - MONA YOUNIS, Ph.D.
With nearly 30 years of experience, I have worked in different capacities to support progressive social and political change. Inspired by social movements for justice, equality, and accountability, I have grappled with questions of the effectiveness and success of movements as a participant, as an observer, and as a student. The desire to understand how they work and when they succeed motivated my doctoral research in sociology at the University of California, Berkeley. I have since concentrated on what can be done to strengthen human rights movements in the U.S. and around the world. I bring to my consulting assignments experience gained in small and large non-profits and foundations in the U.S. and abroad. In the area of human rights specifically, I served as Director of the Science and Human Rights Program at the American Association for the Advancement of Science (AAAS) as well as human rights Program Officer at the Mertz Gilmore Foundation. As a fervent proponent of collaborative efforts, I have also coordinated coalitions to engage constituencies in human rights that include the International Human Rights Funders Group (IHRFG) and the AAAS Science and Human Rights Coalition. In addition, I co-founded two human rights funds that support grassroots initiatives throughout the world: the Fund for Global Human Rights and the Arab Human Rights Fund. My broad professional experience – as advocate, organizer, researcher, university lecturer, program director, and grantmaker – has enabled me to provide thoughtful and appropriate guidance for organizations at various stages of development and in many different contexts. In the course of my consulting, I have designed innovative and effective programs, helped organizations to chart smart and strategic courses of action, evaluated programs and organizations for impact and sustainability, and promoted and strengthened collaboration in a variety of forms. On this website you will find materials on my areas of expertise, information on the issues I have tackled, the types of organizations with which I have partnered, and the projects I have undertaken. You will also find a selected list of clients, client testimonials, and sample work products. I look forward to answering any questions you may have and to exploring the important work we might do together.